Nghe An (VNA) - The National Committee on Traffic Safety on January 4 launched the Traffic Safety Year 2016 in central Nghe An province in an effort to engage the public and improve awareness of traffic safety nation-wide. The committee called on drivers and pedestrians to follow traffic rules strictly and responsibly. It also urged agencies and organisations to outline detailed actions to help reduce the number of traffic accidents and deaths. 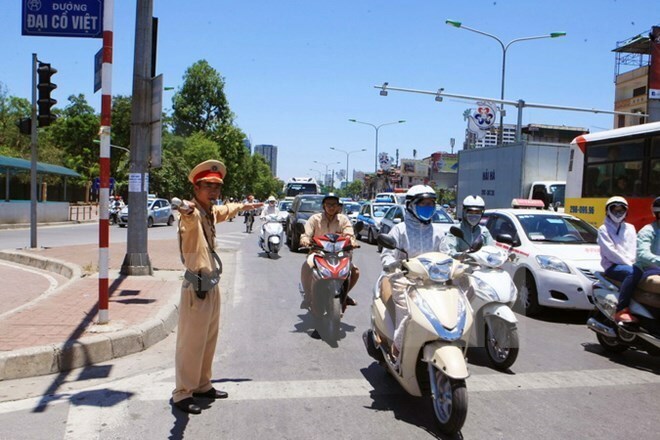 This year, the committee expects to develop a better traffic culture in Vietnam in which police and relevant authorities are urged to work with higher responsibility. According to the committee, more than 22,400 traffic accidents were reported across the country last year, killing almost 8,700 people and injured over 20,550 people. The number of accidents, death toll and injured toll fell by 11 percent, 3.6 percent and 15.8 percent, respectively, compared with that of 2014. The latest committee report reveals that 124 traffic accidents claimed 65 lives and injured 94 people in the first three days of this year. During that time, police on roads detected almost 25,000 traffic violations and collected fines of 12.8 billion VND (570,000 USD). Waterway traffic police cracked down on over 1,000 violations. Meanwhile, Nguyen Van Huyen, general director of the Directorate for Roads of Vietnam, has urged road operators and transport departments in cities and provinces to tighten traffic control, especially because the travelling demand is expected to increase sharply from now until the Lunar New Year (Tet) holiday. He also asked relevant agencies to remove illegal roadside stalls, advertisements and trees to ensure clear vision for drivers.